From ancient Greek theaters, through Shakespeare’s plays at the Globe, and on into the modern era of cinema, masks have been a centerpiece for storytelling. Said masks can take many shapes and have many definitions, but one truth remains: masks are important. No they are vital. To the characters, to the story, and to our understanding of the story. When George Lucas began writing Star Wars he took many of the tropes and themes that had been central to stories across nationalities, religions, eras, and every other arena where a story would be told. Ergo, it is no surprise that Lucas used masks as a tool to create a compelling story and arguably more compelling characters. So when we come to understand the masks, and the wearers of the masks, we come to understand the story all the better. To do so, we must start with the clones. Although not the first mask of Star Wars, the clone’s mask is the first significant mask in galaxy’s timeline. This is critical because it symbolizes a change within the Republic. They are no longer who they thought they were. In order to maintain their facade of stability, they too must put on a mask. The Seperatists, from the point of view of the Republic, were promoting disorder and distention. What better way to oppose such an ideology than to create an army that all looks the same. This shows the literal unity the Republic was trying to convey to their populous. On top of that, these individual humans, who all look the same (aka have the same mission and ideology) willingly put on a mask, forgoing self for the betterment of society. Certainly the clones were programmed to act a certain way, but we know from episodes of The Clone Wars, wherein we saw clones choosing paths other than war, that free will still remained. Order 66 changed the whole perception around the clones. Not only did they kill the Jedi, they killed the idea that individualism should be celebrated. Clones marked their armor in different ways, cut their hair differently, and even got tattoos to show that while they may look the same, they are not the same. Individuals unifying by choice. When the Empire comes around, they squash that, starting with the Jedi. By killing the Jedi, the ones who encouraged the clones to explore that individualism in the Force, the clones killed the idea that individualism was good for society at all. The stormtroopers replaced the clones in more ways than one. First and foremost, obviously, is the fact that they became the new soldiers in light of the clones being decommissioned. 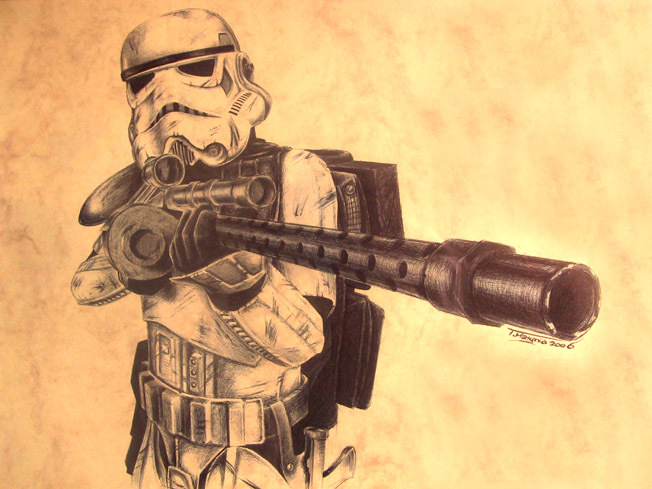 But the meaning behind the stormtroopers is essential in defining the Empire. The Empire did not want individuals. Stormtroopers put on the mask not in an act of commitment, but of submission. They put on the mask, all the same, in order to shun their individualism. The clones, on the other hand, used their individualism as a strength. By so submitting, the stormtroopers gave rise to the strength of the Empire. The strength of the whole was more important than the freedom of the individual. And lest you forget it, there was another masked menace waiting to step in and remind you. The name itself inspires awe as much as fear. Suddenly, after a war devastated the galaxy, there enters a man of mystery. No one knows who he is, save Palpatine, and that is the point. The galaxy knew who the clones and stormtroopers were, knew their purpose. But Vader is something else all together. He is fear. As the audience, we have the privilege of knowing what the backstory of Darth Vader. The story of Anakin Skywalker. When Anakin accepted the mask of Vader it was not because he wanted to, but because he had to. He had to both physically and emotionally. The man who was Anakin Skywalker had to be killed because he was weak. He could not save Padme. So he became something else. At the end of Return of the Jedi, the mask is removed, both literally and symbolically heralding the return of Skywalker. Vader, no Anakin, asks to see his son through his own eyes. He no longer identifies as the facade of Vader, but as his truest self. That is the most important idea about masks. Masks are a way to become something other than who you are; the paths are different, in fact the ends are different, but the motivation is the same. This is not limited to the Empire alone, as we clearly see masks being used by other characters, both prominent and background. First and foremost among those characters is the (in)famous Boba Fett. Fett is, one might say, a bit of a fetish in fandom (I am actually ashamed of this pun… but I digress). Fans have either loved or despised his fame for generations, and this could be due in part to some subconscious part of our being that does or does not identify with Fett. For some fans, Fett is a manifestation of a reality they know well. Being a part of something (clones, a successful family, etc.) that expects you to be something particular. Trying to break the mold and prove you are capable of more. This is the story of many fans, and the story of Boba Fett. Fett is “born” a clone, like millions of others save for one reason. He is special. He is original. He is unaltered. He is a Fett. But being a Fett means he has a standard to live up to. Fett is a name Jango took time to build up so that it may be revered in the galaxy. That it would strike fear and wonder all at once. When Boba steps up to become a bounty hunter himself, this has to be playing in his head. Challenging him to be a better leader, a smarter thinker, and generally just better. Moreover, he has the face of a clone, which comes with stereotypes all its own. If he is going to not only live up to his father’s legacy but break away from being identified as a clone, he has to don a mask both literally and metaphorically. He has to become Boba Fett. This is a troupe used throughout storytelling, and the legacy continues with the new sequel trilogy. When we first meet Rey, she is wearing the mask of a scavenger. Throughout the movie we see that mask torn away. We go from the first image of her, literally covered from head to toe in scavenger garb, to her final one, where she stands fully herself, newly clothed and maskless. Finn, likewise, strips away his mask. When he comes back from seeing the slaughtering done in the name of the First Order, the first thing he does is take of his stormtrooper bucket. Later, as he walks the deserts of Jakku, he strips away the remaining marks of the First Order, leaving his past self, FN-2187, behind. Then, of course, there is Phasma. With simply The Force Awakens as context, it is easy to forget her story. But when all the canon material to date is taken into consideration, we see a different Phasma. An opportunist who takes advantage of masks to get her to where she wants, where she thinks she needs to be. By donning different masks, she is able to become something different. Speaking of becoming someone different… Kylo Ren. Formerly Ben Solo (at least if you ask him), we don’t know the full reasoning behind his mask donning decision. What we do know, from his fateful conversation with Han, is that he believes Ben Solo to be dead. He killed him because he was weak and foolish. From the ashes rises Kylo Ren, newly reinvented into the man Ben Solo was never able to be. Without doubt The Last Jedi will add much more context to this conversation, but what we already have provides a lot of information about what is going on in Kylo’s spirit. In Lucha Libre style wrestling, masks are held in high regard. Wrestlers don’t remove their masks, even in public. So in order to draw interest towards a match that will culminate a rivalry, promoters will put together a match wherein the loser has to remove his mask. It has meaning. It has power. Throughout the whole movie we see him in his mask, as Kylo Ren, until the moment when he begins to talk with Rey. Then he removes his mask. Meaning. Power. As the movie continues on, we see Ren without his mask more often. But it only stays off once he kills Han. After that he believes that he is fully a creature of the dark side and there is no need for the mask. But still he has to hit his wound in order to draw power. He may think he is fully of the dark side, but he is bleeding, a sign of a wound deeper than skin. Ben still exists. We all wear masks of our own, even if we don’t cosplay. We wear masks for various aspects of our life, masks to become what others want us to be, masks to be someone we think we need to be. But all of the masks in Star Wars, when compiled together, provide much to consider. In the end, one truth remains, be wary, oh wearer, because your mask means something far greater than you may understand.